My wife bought this during one of her frequent ‘Random Acts of Purchasing’. I don’t think she knew why she bought it though if I asked her I am sure she’d confabulate an reason that sounded plausible. Nor have we been able to determine where she bought it as she doesn’t remember and we haven’t been able to find it again. I think much of her buying stuff occurs in a somnambulistic haze, but that’s just a typical ‘jerk husband’ thing to say. 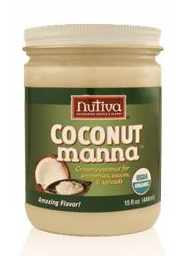 The problem with coconut manna (link here), which is just ground up coconut, is the same problem with coconut oil: the stuff is an unusable block of fat at room temperature. Oils from tropical plants are different from plants in climates that have winters because they never have to worry about the temperature going low enough that the fat would solidify and kill the plant. This, apparently, is why tropical oils tend to be high in saturated fat – which likes being solid at room temperature. Fooled by a container that looked like it was akin to peanut butter, my wife attempted to chop out a little of the stuff, took a tiny taste which was rather flavorless, and left it abandoned in the cupboard…until months later I came across it. What the hell is this stuff? I asked myself. I, too, tried chopping at it with a knife, dug out a few scrapings to taste and was similarly unimpressed. I couldn’t believe that anyone could get away with selling something so useless, so I checked on the Internet, where it stated that you need to soak it in water for a few minutes. Sounded like a lot of work to me – that’s why I have a microwave. I took off the metal top and gave it a ride in the nuker for a few minutes. Now it was warm and creamy. I took a big spoonful and ate it straight. Boy-oh-boy. The creaminess. What a luxurious, nutty flavor. Of course it’s ‘luxurious’ as it is almost 100% fat, but the coconut meat gives it more nutty notes than plain coconut. Really – just by itself, it is a great treat. I took to throwing the jar in the microwave and eating a big spoonful all by itself as a snack (no double-dipping, of course). Eating it warm warm really brings out the flavor, which really was more ‘nutty’ than ‘coconutty’ – really not what you’d expect – probably because the stuff was dotted with brown specs which the manufacturer helpfully explains is not contamination but a natural, and I think important, part of the flavor profile, which makes this hard to categorize as most people don’t think of warming the stuff they usually spread on bread. At least I don’t. One tablespoon is 100 calories – with 80 of those calories from fat and 1 gram net carbs. It’s vegetarian, vegan and induction-friendly, organic to boot, and worth a try if you are looking for a creamy spread, or an alternative to nut butters, want to get more coconut fat in your diet, or just want to try something different that kind of defies categorization. If I was the type of low carber that used those zero-calorie jellies, they would go GREAT with this stuff. Believe me – I’m tempted. I have to try this stuff. Coconut oil is supposed to be very good for you. 1. Coconut oil has a lot of medium chain triglyceride (mct) fats. What I’ve heard is your body usually burns these directly and finds it rather hard to turn this into stored fat. 2. Unlike nut butters, it isn’t high in omega-6 oils. The typical American gets too many omega-6 oils, so this gives you a peanut butter-like flavor without the omega-6. I could mention a half-dozen other reasons, but there are plenty of dubious claims – these two in particular I personally give some credence to – though these may be as wrong as the others – nutrition science is far from conclusive, despite the way most nutritionists talk. Now I’m just waiting for the day they come up with a sugarfree version of Nutella. We weren’t a Nutella family growing up. Nutella was ‘exotic’ to me – I only first had a taste when I was in my 40s – good thing, too – I would have just been a fat kid faster with a nasty Nutella addiction – that stuff is demonic, I tell ya. Nutella is like crack. Eaters beware. Grind the macs in processor to buttery meal, add one egg at a time (wait till sound of motor changes (?) before adding next egg). After all the eggs are in, add the coconut cream (nuke for 20 seconds before measuring) and salt. Process and then quickly add the lemon juice. Into a well greased 8 by 4 loaf pan and into a 350 degree oven for 35 minutes, Remove from pan and cool before slicing or eating. Fat content is VERY high. It looks like bread in the pictures on Hyperlipid. This should give you something to dip into that great olive oil. This is the second comment I got on ‘fat bread’ in one hour. I’m really tempted…but how much does a loaf of this stuff cost to make? My first guess is $10 a loaf? They figured it was about $18 a loaf. Unless you bought nuts at Costco. The thing is–it is very FAT so you can’t really eat much at one time.